Need more information about booking Home 7288680 ? Located in a Brownstone built in 1901, this is a beautiful, light filled 3 bedroom, 1 bath apartment on historic Eastern Parkway in Crown Heights. 1.5 blocks to the train, 0.5 blocks to shops, close to all. 3rd floor with amazing views, sleeps up to 12 and with both kosher and non-kosher amenities available. Coming to see a concert or game at Brooklyn BRAND NEW Barclay's Center? It is just 2 stops away on the express 4 train, or a 10 minute drive away. PLEASE NOTE IN ACCORDANCE WITH A RECENT NYC COURT RULING WE ONLY RENT FOR A MINIMUM OF 30 DAYS. We live on premises and are here to assist you! Very bright, sunny, and open 3 bedroom apartment located on the beautiful landmark Eastern Parkway. This apartment sprawls approximately 1,500 square feet, located in a private 3-family home, on a picturesque block in the very desirable neighborhood of Crown Heights. Only 2 flights up, located on the third floor. (Please note this a walkup – no elevator). Hardwood flooring throughout, and very well-maintained. 1.5 blocks to 3 (local) & 4 (express) trains, Jewish Children’s Museum, and nearby to Barclay's Center, Brooklyn Children’s Museum, Brooklyn Museum, Brooklyn Botanical Gardens, Prospect Park and so much more! Surrounding neighborhoods are Park Slope, Lefferts Gardens, and Prospect Heights. Sleeping up to 12, this fully furnished apartment is available for daily or weekly accommodations on tree-lined Historic Eastern Parkway in Crown Heights, 20 minutes from downtown Manhattan. Northern facing windows, leather sleeper sofa(queen size), coffee table, window A/C, dining room set, & sideboard. Amazing views of the treetops of Eastern Parkway. **SPECIAL FEATURE - ECLECTIC BOOKSHELVES**: Enjoy our "eclectic" bookshelves. No two people have the same taste, so we're slowly filling our bookshelf with an eclectic collection of books and novels. Enjoy what surprises you find there. We know people often like to travel with a new book or novel, but who really wants to carry them back home? Please feel free to leave your books behind for the next guest! BEDROOMS: All our bedrooms feature fresh 100% cotton linens for your comfort in both warm and cool weather, hypoallergenic comforters, and sheer curtains to let the sunshine in. 6.5’ x 17’, this fun room is perfect for children or adults with a twin bunkbed, closet, dresser, and window AC. Northern facing window. 11’x13’, this room features 2 full size beds, closet, dresser, night table, and window AC. Southern facing windows. 11’x18’, this room features 2 queen size beds, dresser, night tables, window AC, Southern and eastern facing windows. Closets are located outside the bedroom. THE ALCOVE: Outside the Sky Room there is a sunny alcove, suitable for optional pack and play or an air mattress. Perfect for when you don't want the kids in your room, but want them nearby enough to hear them. There is a small western facing window. 1 full bath with new multiple-speed shower head, fixtures, fluffy towels. - on-street parking available. (Please note alternate side parking rules apply – email for details). PLEASE REVIEW THE PICTURES for all the details! A NOTE REGARDING THE CLEANING FEE: Cleaning fee is based on length of stay and number of guests. 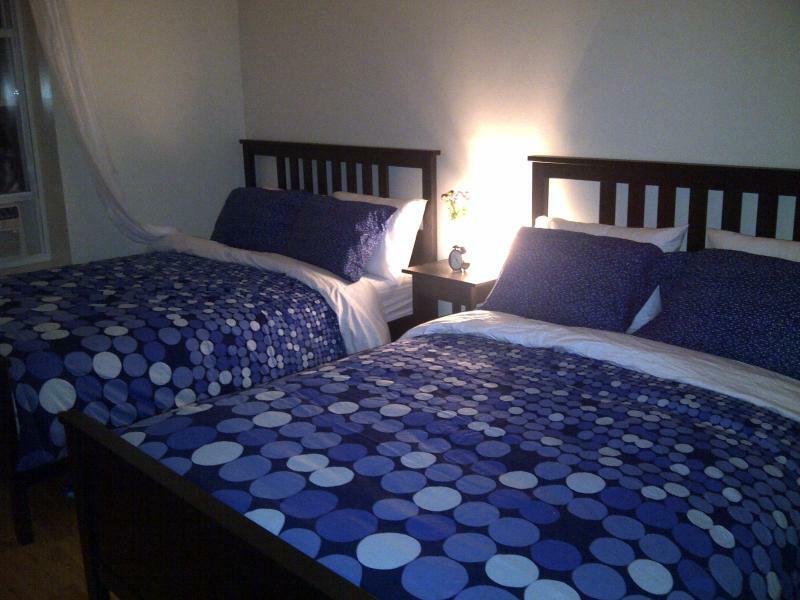 Please contact us for the exact amount of the cleaning fee for your stay. - Tenants are responsible for electric, gas for cooking/dryer, internet, and telephone and must put utilities into their own name. In order to provide the most privacy possible, we only rent the entire apartment - we do not rent individual rooms. Please note we are orthodox Jews and can not respond our sabbath - Friday sunset through nightfall on Saturday. All reservation queries placed during that time will be responded to on Saturday evening. Please treat our home as you would your own. No underage drinking, no illegal drugs, no smoking. We are a quiet residential building. Thank you. You can get in touch with Shaptai Miryam (the owner) through the contact form on this page. Send Shaptai Miryam (the owner) an email through the contact form on this page. Alternatively, if there’s a phone number on this page, you can call them. How do I contact Shaptai Miryam (the owner)? If you’ve already booked, go to Manage your holiday booking to view Shaptai Miryam the owner's contact details or send them a message. Or send Shaptai Miryam (the owner) an enquiry through the Contact the owner/manager form if you’d like a quote or more info first. When you pay online through the Book your stay form, a booking request is sent to Shaptai Miryam (the owner). You’ll find out within 24 hours whether they’ve accepted - no money will leave your account before then. You can also request a quote from Shaptai Miryam (the owner) through the contact form. The owner will email you the total cost for your dates and a link to book and pay online. Use the Book your stay form to pay provisionally online. You can pay by credit/debit card or PayPal. Shaptai Miryam (the owner) will have 24 hours to accept the booking and no money will leave your account before then. Why can't I call Shaptai Miryam (the owner) before booking? You’ll need to contact Shaptai Miryam (the owner) to do this. Send them a message in Manage your holiday booking or through the contact form on this page. You can request to change the dates or number of people on your booking via the Manage your holiday booking page. To change your holiday dates use the Edit booking button. If you need to change the number of guests staying then send Shaptai Miryam (the owner) a message. If Shaptai Miryam (the owner) agrees, they’ll send you a revised quote outlining the changes. You can review and accept/decline this from the Manage your holiday booking page. You’ll have 48 hours to take action before the revised quote expires. Estimated price per night based on a weekly stay. Owner fees of £92.00 per stay may apply. Enter your dates to see the total cost.